Originally described by Manning and colleagues, [10, 11] the BPP has become a standard tool for providing antepartum fetal surveillance. The BPP integrates 5 parameters to yield a biophysical profile score (BPS) and includes (1) the nonstress test (NST), (2) ultrasonographic measurement of the AFV, (3) observation of the presence or absence of fetal breathing movements, (4) gross body movements, and (5) tone. Table 1, below, describes specific criteria for the BPS. The BPP allows 2 points for each parameter that is present, yielding a maximum score of 10; however, if all of the ultrasonographic variable findings are normal, the FHR variable may be excluded, because no change is made in the predicative accuracy of the BPP by including the FHR (see the graph below). If 1 or more ultrasonographic variable findings are abnormal, the NST should be performed. Reactive nonstress test. The top graph plots the fetal heart rate over time. Each small box represents 10 seconds along the horizontal axis and 10 beats per minute along the vertical axis. The baseline fetal heart rate is from 140-150 beats per minute. This tracing is reactive, since at least 2 accelerations of the fetal heart rate occur within less than 20 minutes. Fetal breathing movements should include 1 or more episodes of rhythmic fetal breathing for at least 30 s or more in 30 min. Manning et al's revised findings from 1999 are modified to include only 20 s, as stated in the table. Gross body movements should include 3 or more discrete body or limb movements within 30 min. Each of the movements evaluated in the BPP results from efferent signals originating in different central nervous system (CNS) centers, which mature at different gestational ages (see Table 2). Table 3 shows a variety of factors, other than hypoxemia, that have been shown to affect different BPP parameters. Key: A blank box indicates that no data are available for that parameter. Horizontal lines indicate that the parameter has been studied and that no change is demonstrated. Arrows indicate that the parameter has been studied and that it increases or decreases as shown. The ultrasonographic portion of the biophysical profile (BPP) should begin with notation of the starting time. The profile may be completed when all of the variables have been observed; however, a full 30 minutes must elapse before the profile is judged to be abnormal. The scan should start with a general survey, noting the position of the fetus and the presence of cardiac activity. Although not part of the BPP, surveying the placental position and grade and the fetal morphology is common practice during observation of fetal activity. Amniotic fluid volume (AFV) is assessed as normal if 1 or more pockets of fluid are detected that measure at least 2 cm along the vertical axis. Oligohydramnios is present if the largest pocket measures less than 2 cm. The pressure applied to the transducer by the sonographer is inversely proportional to the depth of the fluid pocket. Careful attention to transducer pressure is required to avoid a false diagnosis of oligohydramnios, which can result from excessive transducer pressure compressing the maternal abdomen. Fetal movements are judged as normal or abnormal according to the criteria established in Table 1. The first video below shows breathing movements, while the second video shows movements that can be mistaken for fetal breathing. Fetal breathing movements. Video shows a rhythmic deflection of the fetal chest wall and diaphragm that is clearly distinct from the rhythmic motion of the fetal heart. Note that the image begins in the transverse view, but the ultrasound transducer is then rotated to show a sagittal view and, finally, an oblique view. The episode of continuous fetal breathing lasts well in excess of the required 20-second period. False fetal breathing movements. Although some transient fetal breathing movements are seen, the video does not include 20 seconds of continuous fetal breathing. Note that the maternal breathing and aortic pulse seen posteriorly and the fetal aortic pulse seen on the sagittal view, along with fetal cardiac activity, can cause deflections of the fetal chest wall, which can be mistaken for fetal breathing movements. The following videos demonstrate gross movements of the lower and upper body and tone. Gross fetal movements and tone. Video demonstrates generalized movements of the fetal lower extremities, including 1 episode of flexion and extension. Gross fetal movements and tone. Video demonstrates generalized movements of the fetal upper extremities. The upper extremity rests in front of the fetal chest and chin. Although the ultrasound transducer is moving laterally across the maternal abdomen, 2 distinct episodes of flexion and extension are seen. Note the many cross-sectional views of the 3-vessel umbilical cord and the floating echogenic particles of vernix in the amniotic fluid. The video below demonstrates the amniotic fluid index (AFI) by measuring 4 pockets of fluid. Amniotic fluid index. The largest pocket of fluid is measured in each quadrant of the maternal abdomen in the vertical dimension. Then, each value is added to yield the amniotic fluid index. To obtain an AFI, the mother must be in the supine position and the linear ultrasonographic probe must be parallel to the maternal spine and perpendicular to the floor for all measurements. The abdomen is divided into 4 quadrants, with the umbilicus delineating the upper and lower halves and the linea nigra delineating the left and right halves. The largest pocket of fluid in each quadrant is measured along the vertical dimension, which is the dimension perpendicular to the ultrasonographic probe. The pockets must be free of umbilical cord or fetal extremities, although brief appearances of these are acceptable. The video below demonstrates measurement of the AFI. A modified biophysical profile (BPP), consisting of a nonstress test (NST) and an amniotic fluid index (AFI), is used widely. If either the NST or the AFI is abnormal, a complete BPP or a contraction stress test (CST) is performed. The modified BPP, CST, and complete BPP have similarly low false-negative mortality rates, defined as the number of fetal deaths within 1 week of a normal test result. Nevertheless, no clear evidence exists that the 2 variables used in the modified BPP are better predictors than the other variables omitted from the BPP. Furthermore, this method requires 2 modalities for fetal evaluation, while normal ultrasonographic findings in a BPP eliminate the need for an NST. Antepartum testing using the biophysical profile (BPP) or any other method should not be performed earlier than the gestational age at which extrauterine survival or active intervention for fetal compromise is possible. Furthermore, no indications exist for testing in a fetus at term when likelihood of successful induction is high or when vaginal delivery is contraindicated for obstetric reasons. For patients with a low probability of successful induction, the BPP is a useful tool that can be used while waiting for cervical ripening. In these patients, the purpose of the BPP is to avoid the maternal morbidity resulting from failed induction followed by cesarean delivery. The frequency of testing varies according to the clinical variables in each patient. In most high-risk pregnancies, testing plans start with weekly testing,  although twice-weekly testing is the standard for pregnancies beyond 42 weeks and for patients with insulin-dependent diabetes. Frequency of testing increases in direct proportion to the severity of the maternal or fetal condition. In unstable pregnancies with progressive deterioration of the fetal condition, abnormal umbilical cord blood flow patterns occur first. Subsequently, FHR variation is reduced, followed by loss of breathing movements, while general fetal movements and tone are the last parameters to demonstrate abnormal results. Frequent assessment of fetal BPP movements may help prolong the pregnancy in fetuses with a marginally reduced FHR variation. An abnormal BPS should prompt further evaluation or intervention depending on the circumstances. If an abnormal score occurs in a term fetus, preparation should be made for delivery. An abnormal score in a fetus remote from term requires conservative management, since the risk of fetal death is similar to the neonatal mortality rate resulting from prematurity. In these patients, daily testing often is performed. Table 4 provides general guidelines for treatment following the BPS. The biophysical profile (BPP) is a reliable method of predicting fetal survival. Data have been collected on this and other antepartum testing procedures for more than 20 years. Testing methods usually are evaluated by comparing the false-negative mortality rate for each method. The false-negative mortality rate is defined as the number of fetal deaths, corrected for lethal congenital anomalies and unpredictable causes of demise, that occur within 1 week of a normal test result. The BPP has a false-negative mortality rate of 0.77 deaths per 1000 tests. Furthermore, the BPS highly correlates with the antepartum fetal umbilical venous cord pH level. The false-negative mortality rate for the nonstress test (NST) alone is 1.9 per 1000 tests, more than twice that of the BPP. The modified BPP has a mortality rate of 0.8. The low false-negative rates of these testing methods depend on an appropriate response to an abnormal result. Intervention and retesting are the usual responses. ACOG. Antepartum fetal surveillance. In: Practice Bulletin 9. American College of Obstetrics and Gynecology. Oct 1999. Guimarães Filho HA, Araujo Júnior E, Nardozza LM, Dias da Costa LL, Moron AF, Mattar R. Ultrasound assessment of the fetal biophysical profile: what does an radiologist need to know?. Eur J Radiol. 2008 Apr. 66(1):122-6. [Medline]. Lalor JG, Fawole B, Alfirevic Z, Devane D. Biophysical profile for fetal assessment in high risk pregnancies. Cochrane Database Syst Rev. 2008 Jan 23. CD000038. [Medline]. Alfirevic Z, Neilson JP. Biophysical profile for fetal assessment in high risk pregnancies. Cochrane Database Syst Rev. 2000. CD000038. [Medline]. Booker W, Fox NS, Gupta S, Carroll R, Saltzman DH, Klauser CK, et al. Antenatal Surveillance in Twin Pregnancies Using the Biophysical Profile. J Ultrasound Med. 2015 Nov. 34 (11):2071-5. [Medline]. Payne BA, Kyle PM, Lim K, Lisonkova S, Magee LA, Pullar B, et al. An assessment of predictive value of the biophysical profile in women with preeclampsia using data from the fullPIERS database. Pregnancy Hypertens. 2013 Jul. 3 (3):166-71. [Medline]. Oyelese Y, Vintzileos AM. The uses and limitations of the fetal biophysical profile. Clin Perinatol. 2011 Mar. 38 (1):47-64, v-vi. [Medline]. Turan S, Turan OM, Berg C, Moyano D, Bhide A, Bower S, et al. Computerized fetal heart rate analysis, Doppler ultrasound and biophysical profile score in the prediction of acid-base status of growth-restricted fetuses. Ultrasound Obstet Gynecol. 2007 Oct. 30(5):750-6. [Medline]. Habek D, Salihagic A, Jugovic D, Herman R. Doppler cerebro-umbilical ratio and fetal biophysical profile in the assessment of peripartal cardiotocography in growth-retarded fetuses. Fetal Diagn Ther. 2007. 22(6):452-6. [Medline]. Manning FA, Platt LD, Sipos L. Antepartum fetal evaluation: development of a fetal biophysical profile. Am J Obstet Gynecol. 1980 Mar 15. 136(6):787-95. [Medline]. Manning FA. Fetal biophysical profile. Obstet Gynecol Clin North Am. 1999 Dec. 26(4):557-77, v. [Medline]. Turan S, Miller J, Baschat AA. Integrated testing and management in fetal growth restriction. Semin Perinatol. 2008 Jun. 32(3):194-200. [Medline]. Manning FA, Morrison I, Lange IR, et al. Fetal biophysical profile scoring: selective use of the nonstress test. Am J Obstet Gynecol. 1987 Mar. 156(3):709-12. [Medline]. Flack NJ, Dore C, Southwell D, et al. The influence of operator transducer pressure on ultrasonographic measurements of amniotic fluid volume. Am J Obstet Gynecol. 1994 Jul. 171(1):218-22. [Medline]. Kehl S, Schelkle A, Thomas A, Puhl A, Meqdad K, Tuschy B, et al. Single deepest vertical pocket or amniotic fluid index as evaluation test for preventing adverse pregnancy outcome (SAFE trial): a multicentre, open-label randomised controlled trial. Ultrasound Obstet Gynecol. 2015 Jun 10. [Medline]. Sande JA, Ioannou C, Sarris I, Ohuma EO, Papageorghiou AT. Reproducibility of measuring amniotic fluid index and single deepest vertical pool throughout gestation. Prenat Diagn. 2015 May. 35 (5):434-9. [Medline]. Petrozella LN, Dashe JS, McIntire DD, Leveno KJ. Clinical significance of borderline amniotic fluid index and oligohydramnios in preterm pregnancy. Obstet Gynecol. 2011 Feb. 117 (2 Pt 1):338-42. [Medline]. Eden RD, Seifert LS, Kodack LD, et al. A modified biophysical profile for antenatal fetal surveillance. Obstet Gynecol. 1988 Mar. 71(3 Pt 1):365-9. [Medline]. Nageotte MP, Towers CV, Asrat T, Freeman RK. 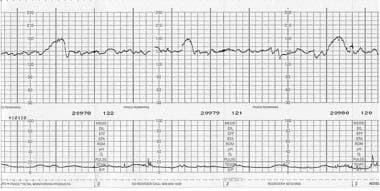 Perinatal outcome with the modified biophysical profile. Am J Obstet Gynecol. 1994 Jun. 170(6):1672-6. [Medline]. Miller DA, Rabello YA, Paul RH. The modified biophysical profile: antepartum testing in the 1990s. Am J Obstet Gynecol. 1996 Mar. 174(3):812-7. [Medline]. Graves CR. Antepartum fetal surveillance and timing of delivery in the pregnancy complicated by diabetes mellitus. Clin Obstet Gynecol. 2007 Dec. 50(4):1007-13. [Medline]. Vintzileos AM, Gaffney SE, Salinger LM, et al. The relationships among the fetal biophysical profile, umbilical cord pH, and Apgar scores. Am J Obstet Gynecol. 1987 Sep. 157(3):627-31. [Medline].